Through the decades DX-listeners and radioamateurs have been pioneers in broadcasting. In the beginning of the 20th century many broadcasting pioneers around the world were radioamateurs. In the 1970's there was again a huge amount of new small radiostations on the air in many European countries. This time the enthusiasts were mostly DX-listeners. For some reason through the years the enthusiastic pioneers have been broadcasting illegally without licences. I also wonder why broadcasting has always been so close to the hearts of so many active radioenthusiasts? In the end of the 1980's some active Finnish radioenthusiasts started to form a loose group. We were radioamateurs, DX-listeners, piratebroadcasters, scannerlisteners and CB'ers. We came from different parts of Finland. We were men, who always wanted to reach out for something new and different. In 1999 we were in a kind of critical situation. We were bored. We desperately wanted to break through and do something special first. Go, where no man has gone before. Just for our own mental stability. We had 10 men in our group and we had alltogether almost 200 years of radioexperience. That's why it was quite difficult to find something totally new in the radioworld in Finland. Most bands and modes were already heard and done. When we continued to discuss about the possibilities, we found ourselves again and again talking about the same subject: broadcasting. In Finland broadcasting is the most limited part of the radio as a hobby. FM was out of question, nothing new there. In mediumwaves there has been Finnish private stations already on the air. TV sounded a bit too expensive for us poor enthusiasts. There were no legal equipment available for the long waves and we doubted if we can built it ourselves. But... how about the shortwaves? The idea about a legal, independent shortwave radiostation hit like a zillion volts. Or watts. That hasn't been done in Finland before. Untill now. Quick connections to different parties proved that in theory this could be done. The biggest problem was to find a legal transmitter. Also it would be nice if the station could be founded with only a handful of dollars. Or without any dollars. But everything can be done. If there is a will, there is a way. Now there was a will. We just had to find a way. We were surprised to find out how many different kinds of recources and talents were represented in our group. We were able to do almost everything by ourselves. In our own sparetime with a "fistful of dollars." The transmitters were built by ourselves. The transmitters were tested in a member's workplace and approved by the Finnish DTI/FCC. The association was founded. The stationbuilding was reconstructed. The studio was built. The licences were applied. The results of the enthusiasts' hard work were heard on the airwaves already less than one year after the GO! -decision. In the town of Virrat, in the village of Liedenpohja operates the Scandinavian Weekend Radio. SWR started broadcasting in shortwaves 2nd July 2000. 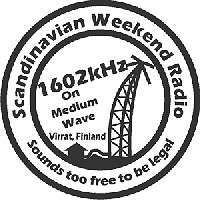 SWR is the first and only independent, commercial, private shortwave station in the Nordic Countries (Finland, Sweden, Norway, Denmark, Iceland). SWR broadcasts every first Saturday of the month at 00.00 - 24.00 Finnish time. At wintertime that is UTC +2 hours and at summertime UTC +3 hours. SWR is also on the air in some special occasions like at Christmas. And of course during the 2002 EDXC-meeting in Pori. Untill May 2001 SWR was broadcasting only in 25 meters in 11690 and 11720 kHz. In June 2001 SWR started to use another transmitter. It operates in the 48 mb, where the frequencies are 5980, 5990 and 6170 kHz. In the 25 mb the reception has been best in Central-Europe and the British Isles, but SWR has also received many reception reports from USA and Canada. In the 48 mb the reception is usually best in Finland and in the neighbouring countries. An association called "The support association of alternative broadcasting" is responsible for the operation of SWR. The editors and DJ's of the station are mostly members of the association. All members have fulltime jobs elsewhere and no-one is a radio professional at the moment. All the members have sometimes been working on some other radiostations, either as editors or in maintenance. SWR gives airtime to contributors and students. So far over 50 future journalists have made their debut on radiowaves at SWR. SWR also relays good quality shows from organisations like Radio Marabu from Germany and The Big Backyard from Australia. The station has been built to an old farmhouse in the countryside. There are studio, kitchen, lobby, outside toilet, sauna and a room for sleeping. The antennatower is located in the garden and it is about 20 meters tall. In the studio SWR uses mostly inexpensive equipment from wellknown manufactures. For good quality programming SWR has: 2 MD-decks, 3 CD-decks, 2 turntables, 1 MC-deck, 2 mixers, 2 audio amplifiers, compressor-limiter and 3 microphones. Finnish law requires that all programs are recorded. For that purpose SWR uses a VHS-videorecorder. The incoming calls are feeded into the audiomixer with the help of a Nokia GSM-telephone and a hands free set. The antenna for 25 meters is a 2-element yagi hanging about 20 meters above the ground on top of the antennatower. In 48 mb SWR uses a special cage dipole antenna some 10 meters of the ground. The transmitter power in 25 mb is 50 watts and in 48 mb 100 watts. Upgrades in power and antennas are planned and will follow sooner or later. SWR has no format and no playlists. There is some loose quidelines. For example we have decided that over half of the music should be from Finland. SWR also aims to play mostly music that is not played in other radiostations. The editors are couraged to use other languages than Finnish. English is most common language in programs. The editor makes the final decision by himself. He plays whatever he wants and talks whatever he wants. Almost all programs are broadcasted live. Luckily the SWR editors have very different tastes of music. That's why there is lots of different music in different shows. DJ Ville has a show called "Perkele" (= devil), where he plays heavyrock and other black and hard music. DJ Tex Willer loves rootsmusic and plays Rock'a'billy, country and '50's rock'n'roll in his "Rockin' Rhythm" -show. DJ Häkä gives listeners a chance to listen to mellow soul, techno and finnish language music. SWR has only limited recordcollection. The editors mostly bring their own records to SWR when they have a show to do. Some recordcompanies send promocopies to SWR. Especially small independent recordcompanies love the possibility to reach listeners around Europe. Most of the shortwave listeners are DX-listeners. That's why SWR produces lots of programming for people who are interested in radio. "History of Finnish Radio" gives useful and interesting information about the past changes in Finnish radioworld. You can also hear DX-news, pirateinformation, etc on SWR-frequencies. Just check www.swradio.net and hear it all by yourself! Even though SWR is a commercial station, there has been only a few advertisers so far. They have been companies who want to support independent broadcasting in Finland. SWR is not selling radioadvertisements actively. The station gets the needed money mostly from the members. The biggest cost for the station are the music copyright fees. SWR is operated by the volunteers. SWR is open for people who love radio. SWR rents airtime to enthusiasts who want to be on the air. All of you are very wellcome to visit the station during the broadcasts also after the EDXC-meeting. If you happen to be in Finland around the first Saturday of the month, come and see SWR. You can find more information and great photos about SWR in SWR-webpages at www.swradio.net. You can send questions, reception reports and comments by e-mail to info@swradio.net. The mailing address is SWR, P.O.Box 99, FIN-34801 VIRRAT, Finland. SWR answers to all correct reception reports with a multicolor QSL-card. Just remember to enclose 2 euros, 2 IRC's or 2 USD with your report. SWR is alive and kicking, because there has been so many people who have been working hard to make their dreams come true. Like the slogan says: "Sounds too free to be legal." The author was first time applying for a broadcasting licence in 1983, he has been producing radioshows to 6 countries and he has been a managing director of a large Finnish local radiostation.